Angus: Learn a new tool or three..
Part of the excitement of being in the Information Technology industry is that we get to be privy to the fabulous stuff that runs the world. Having been a computer geek of some form or another since high school, having had one of the first generation of IBM PCs, along with having an IT consulting career, I have witnessed so much of the history of computing. I am constantly amazed by what is new at every turn. The iPad changed the world. QR codes came, were predicted to have a short life, and are now pervasive. Connecting the world is getting easier. Communicating with friends, family and spammers is a snap. Voice recognition will probably disappear as bond conduction technology improves. Finger gestures on a tablet will move to the air. Technology amazes, surprises, and constantly changes. However, there are some amongst the IT faithful who still use a hammer to solve every problem. All around us, we see new technology that can be used for our businesses. There are new methodologies, new development techniques, and tools that can improve our agility and the agility of our applications, and turn IT into an effective strategic business partner. And then, I attend a user group conference or meeting in the IBM i community. I am told about how the AS/400 rocks. I am told how iSeries is the best platform IBM sells. I am told how “I don’t like the name, so I ain’t using it”. On a technical mailing list, a reply to a post with “IBM i” in the title contains the words “on the System i”. References are made to a platform that is dead, one that is almost gone, and one that has been forgotten. And none of those is as amazing, surprising, or evolving as IBM i on Power. What happened to our community? The overall general confusion of using outdated branding simply looks like we don’t care about our platform enough to learn about our platform. Yet, each of these ignorant iBlasphemers claims to love love love this incredible platform. They state that it is the best on the planet. Which begs the question: If your platform is so great, what would happen if they upgraded it to something new and more incredible? Wouldn’t you want to move to that MORE incredible technology? Well, IBM i is. All that you could do on your wonderful AS/400, incredible iSeries, fabulous System i, is available on the amazing, wonderful, fabulous IBM i on Power. If you don’t already have IBM i on Power, your next upgrade to a new server will bring you there, and your next upgrade to a used server will get you closer. IBM i is your platform, it is the current platform IBM is evolving, and your toolbelt should contain more than just the hammer of “I don’t like the name”. As IT Professionals, isn’t it our own responsibility to keep up with technology? When you utter the out of date branding as though it were a new thing, your hammer is showing. After FIVE years of IBM i, your hammer is rusty. The buildings you are creating will topple at the first wind, and no one wants to live in them any more. Arm yourself with a little knowledge and make this community whole once more. To build a future on modern technology, rediscover your passion for IT, and you will find your passion for IBM i will be sparked. Angus: Wallow in our future. During this week’s COMMON Annual conference, it was refreshing to see how the IBMi25 campaign, simply by its existence, stirred more of the community to reference the platform by its current branding. The speakers, for the most part, have upped their game, and this too, impacted the community in a positive way. There are still some holdouts, making various (ignorant, IMO) excuses, but that is almost gone from this event. Vendors are slowly getting their act together, and the number of booths with some past branding was reduced from previous events. When confronted about their lack of support for the ~actual~ platform, there was the usual (ignorant, IMO) stable of excuses. For my part, I talked with several vendors about the difference between marketing a product and marketing to an audience (see my blog titled Marketing in the 21st IBM i century! ), and it resonated very well. I think this is a successful approach to having vendors understand that their support for our platform is better served by leading with IBM i and understanding SEO to attract those customers who are as yet, unaware of the incredible combination of IBM i on Power Systems. Other IBM i pundits, including some of the IBM Power Champions, approached vendors with their own thoughts on modernizing their branding vernacular and supporting the future of our platform. It seems that until vendors realize that their outdated marketing efforts are keeping customers in the dark and causing harm to the future of IBM i, there will still be a need to confront their activities with some strength. It is true that some vendors either do not understand marketing, or have incompetent or unqualified marketers, or simply trust their marketing to their sales organization. In all these cases, they do not realize that IBM i on Power Systems is a new paradigm – an OS running on the best business hardware in the world, and an OS that will support and run all the applications running on your “old” platform. They seem to be confused when one person utters an old brand name, and being unarmed with the facts of the platform evolution, choose to ignore the obvious fact that with a very small amount of education, they could not only convince the customer or prospect of the value of an upgrade to IBM i, they might engender a solid amount of excitement and passion for our beloved platform. In my case, I began a Twitter campaign using the hashtag #IBMiStepUp – see more in my blog post titled Step up to IBM i!. When I see a vendor with a particularly abhorrent campaign or website, an #IBMiStepUp tweet will call them out and encourage them to lead with IBM i. One vendor in particular – who does well in support of our platform, has a specific marketing campaign that includes a daily “IBM i” online paper. They informed me I would be excluded from that campaign.. er.. paper, because I was a bully. Since then, none of my tweets from my angustheitchap handle will appear in their “paper”. As it turns out, they have also filtered out (censored?) other IBM i champions and tweeters from their “paper”. This seems to me to be quite wrong – advertising an “IBM i” publication that is nothing more than a marketing campaign for their own company, disguised as support for the community. If it were named for their company, it would not be as heinous, but it is simply one more example of the community having to sort through vendor FUD. This community deserves more from its leaders, speakers, pundits, and vendors. The first step is realizing that IBM i on Power Systems is a new paradigm, and the one that is our future. No matter your current platform, you will/should soon be upgrading to IBM i on Power. The more leaders, speakers, pundits, and vendors who talk about the old branding, the more our customer base will believe there is no future, and the more will be convinced to leave the platform entirely. If this is not clear by now, the fifth anniversary of Power Systems and IBM i, then it has to become obvious and the focus for our leaders, speakers, pundits, and vendors. Last week on Twitter, one vendor defended their use of old branding to sell modern technology by claiming they were “Switzerland in the name game”. Ironically, by saying there is a name game, they actually engaged in it – engaging in war is not neutrality. If you are a leader, speaker, pundit, vendor, customer, developer or any other kind of interested community member, then it is time to stop the noise. Any time you respond to the use of the old branding with the new branding (with no argument needed), you are educating and promoting our future. Any time you respond in a forum that is branded for the past, you have an opportunity to educate and promote the future (with no argument needed). Any time you drop the old vernacular, recognize and respond to the old with the future, you are educating and promoting our platform. Isn’t it time you stepped up? Stop engaging in a game that should have been put to bed five years ago when IBM upped theirs. Move away from the vernacular of the past, which by its nature supports a mentality of living, developing, and promoting the past. Find the place where you are comfortable in talking about your platform in modern and future terms – which will start when the current branding becomes native to your own brain. It is time to wallow in our future. The 20i3 COMMON Annual conference is being held in Austin, TX this week. IBM have brought their IBM i 25th Anniversary celebrations. With that, the excitement in the community in attendance has been stirred, the passion is high, and the conference is buzzing. There are, as usual, some holdouts. One prominent vendor is advertising their System i products – I stuck an IBM i sticker over that. Several vendors are promoting iSeries solutions, and attendees are generally giving them grief. The excuses range from “the customers call it that, so I have to” to “the platform is dead” to “IBM i is just iSeries”. All of these excuses are utterly ignorant, showing that the vendors do not understand marketing a product as opposed to marketing to an audience. Their marketing skills seem to resort to poor selling techniques when their first response to the “why iSeries” question is not a question, but a defense born of frustration. Certainly, vendors – and the community, need to understand and learn how to market IBM i products to an audience which includes IBM i customers, iSeries customers, AS/400 customers, and the occasional System i customer. However, this should not preclude them from understanding that while we have a strong legacy (proven) starting with the AS/400, we have had IBM i on Power Systems (which is a NEW platform, BTW) for five years. IBM i has proven its longevity. While customers may be holding out, vendors have a responsibility to educate, support, and promote IBM i – the future of our platform. They must upgrade their marketing. And, the ignorant defense of “thats what the customer calls it” needs to be removed from the equation. If you are a leader in our community, you will be a leader, not a follower. And the rhetoric of “the platform is dead” or “the platform has no future” or “the platform is dying” needs to simply be dropped from the vernacular of those vendors who are in this industry for the long term. Not a whisper, not a mention, not a hint of that FUD should be uttered from anyone in our community. Then, when we hear that FUD, we know it is coming from those who wish to migrate us from the platform, and we can act accordingly. I will have been in the United States for 25 years on May 15th, 20i3. I was working as a System/38 consultant, teaching RPG and SYNON, and working on midrange ERP applications, when I was offered a job and upon accepting, moved to Chicago. Last week in Manhattan, I had dinner with the owners of the company who brought me to the U.S. It was a wonderful evening, reminiscing and catching up. Our conversation were also very lively about the future of computing, devices, applications, user experience and I.T. in general. Our shared past is very special to us, and our shared passion for the world of I.T. means we will remain friends for many years to come. I feel very much the same way about IBM i and the community around the platform. A month after I arrived in Chicago in 1988, the AS/400 was announced. Of course, much of the community were aware of something happening at IBM (named Silverlake) that would affect S/38 and S/36 customers, and there was huge excitement in the industry to match the announcement from IBM. Twenty years later, with the merger of System i and System p hardware into Power Systems we were reminded of how amazing our AS/400 was. IBM, however, continued the amazing, evolving OS/400 into IBM i – an operating system worthy of our heritage, and built to run on the new industry leading Power Systems servers. In the last five years, our new home has proven to be a hardware platform on which we have a strong future. IBM i will celebrate its 25th anniversary in world class shape, leveraging an incredible heritage. For our community, our shared past is very special, and our shared passion for IBM i means we will remain friends for many years to come. I am excited to watch – and participate – in the IBM i 25th anniversary celebrations. You can be engaged in many ways, and Steve Will starts the ball rolling with his latest You and I blog entry. And, while you are muddling around on Facebook today, like the IBMi25 page for even more continuing action. See you in Austin for the in-person celebrations! Angus: Marketing in the 21st IBM i century! If IBM i really is the best platform on the planet, why are people trying to sell its predecessors? To whom are you marketing? I hear the same (tired old) complaints about our community, in that they mostly do not call the platform by its current branding. Many customers I visit do refer to the platform as AS/400, iSeries or System i, and occasionally something more obscure like i5. The marketer response has been that “we have to cater for all these perspectives”. And, to cater for that audience, marketers use various names for the product they are pitching, thinking that will attract the audience they desire. Instead, it makes them look like they are trying to sell coal to fuel a gas heater. It is important to distinguish WHAT you are marketing from the audience TO WHOM you are marketing. Using an old platform name to attract an audience, is like trying to sell a Windows tablet by calling it a DOS computer. A skilled marketer would be selling a Windows tablet by marketing to everyone – including a Windows audience and a DOS audience. But they would never market something by its old branding. So, it is time for marketing teams in our IBM i community to get their act together. It is time to start marketing the hell out of IBM i. Instead of changing the branding in a poor attempt to attract the desired audience, we should be marketing IBM i products, events, jobs, etc, to an IBM i, System i, iSeries and AS/400 audience. Using buzzwords and old branding should not be the focus – instead, it should be a means to attract an audience to the cool, new and exciting things that IBM i represents. Find your IBM i product, and market it to the IBM i, iSeries, AS/400 and System i audience. Here is a little clarification. 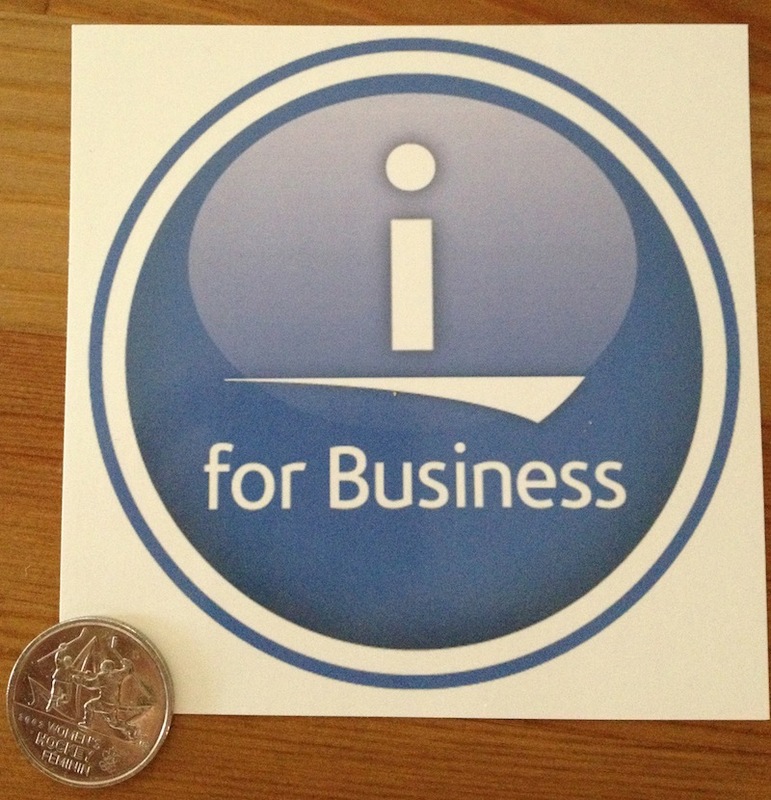 The IBM i branding is so easy! When you speak, say i. When you write, use IBM i.
whatever they call it today..
(Borrowed from the current title of the IBM i home page). It is so easy, it bears repeating..
Start your day with a new attitude towards the platform you love! Angus: Step up, stand up – for what you believe..
Last week, a video was posted about COMMON, A User’s Group. In the middle of it, a retired IBMer refers to himself as a RiP – which he says means Retired iSeries Professional. Several people excused him, because they said he had retired when it was an iSeries. Unfortunately, he retired since IBM i was released, and he was an IBMer. Both of these mean he should be familiar with the branding. Retired or not, this is an oversight and a lack of support for the platform. The video was posted on Facebook, and my name was tagged as being in the video. So, I politely asked “What’s an iSeries?”. The ensuing witless vitriol was far more than I expected. This particular IBM i ‘pundit’ apparently feels rather threatened by my words, and turned those three words into some kind of personal attack upon his person. I attempted to point out that his claim of “the only thing that changed in the past 23 years is the name and the color” was false, but his additional responses simply showed more of his ignorance about the platform. Ignorance, it seems, is the problem in the community. Working with customers on this platform who still think it is an AS/400 or iSeries, and still code in the same manner as they always have, is difficult when I challenge their belief systems. I understand it makes them feel inadequate, and that my encouragement to modernize makes them feel they have done something horribly wrong, but all I am asking them to do is to educate themselves on the platform. I am working to provide a means of education for our community, and at the aforementioned COMMON conference, I will be presenting a session on exactly that topic. In the meantime, what frustrated me more than the bullying of the responder on Facebook, was the complete and utter silence from every other reader. Most of the people I know in the community are aware that “the only thing that changed in the past 23 years is the name and the color” is beyond ignorant, utterly false, and promoting the wrong message. And, given that several people were tagged in the Facebook thread, many people would have read this statement. Not a single one responded to correct this ignorance. Not one. Certainly, it is difficult for some people to engage in any kind of emotional debate, any argument, or any controversy on public forums. But, by not correcting this falsehood, it remains out there with only one voice to negate it. The strength in numbers rule would apply here, and if four, five or ten people were to post a note to disagree with this incorrect information, how powerful would that have been? The problem remains that we are scared of bullies, and cyberspace is one of them. And, activity that does not fit your own personal worldview can be downright scary. I have been accused of bullying with my #IBMiStepUp twitter campaign, from someone who could not stand the heat of being identified as a poor marketer. They lashed out at me, and no one stepped up to defend my position. Yet, it is quite a simple thing to do – post a response to negate the BS, FUD, crap and lies being spread about our platform. I expect we have a catch-22 – no one wants to take the first step, for fear of getting into an argument that they cannot get out of. But… it is quite simple. If you love the platform, then it takes no time at all to defend and promote it. One sentence to stand up for what is right, 140 characters to fix some misinformation, and then stop. There is no need to take on the ignorant in an all-out battle. Simply state the case FOR the platform, and step down. Soon, the voice of the community will be heard in more places. Take that first step. Go on, step up! Stand up for what you believe. Your platform needs you. The feedback from my #IBMiStepUp Twitter campaign has been fascinating (more on that campaign here). There are a few retweets of some of the tweets, there are a lot of people who read and comment to me in person later, and yesterday I was attacked for posting negativity and rants. Although, being called a rant of 140 characters is quite a compliment! Several companies and individuals have responded to the #IBMiStepUp request, and have upgraded their websites, marketing, and so on. Slowly, there is a movement towards supporting IBM i and its future, while moving away from the past. However you view the campaign, it goes on everywhere. At an IBM Champions meeting, I talked with the IBMers responsible for the IBM i landing web page. At the time, the title started with “AS/400” and the large print was something like “IBM i (including AS/400, iSeries and System i). You may notice that this has been upgraded, and now, the title of the IBM i landing page says: “IBM i (Power Systems software supporting AS/400, iSeries and System i applications)”. The large print now says “IBM i” subtitled with “For Power Systems”. This is wonderful, and it shows IBM’s willingness to respond to the community’s requests. Of course, IBM must have tens of thousands of web pages, and when people complain about one or more of them mentioning an old brand in the wrong context, I ask them to contact IBM, or talk with an IBMer at an event like COMMON or the RPG & DB2 Summit. One of the major complaints in our community is that IBM does not update their documentation “quickly” enough. I am sure they have millions of pages to update, and my argument has always been a question of where you would want IBM to invest their dollars. Would you rather IBM spends money upgrading the OS features and functions, or would you like IBM to spend their limited (you know it is) IBM i budget dollars on documentation of every page ever written about our platform? For a moment, I was stunned – until I realized that IBM i5/OS PASE was probably the name of the product when the documentation was written. 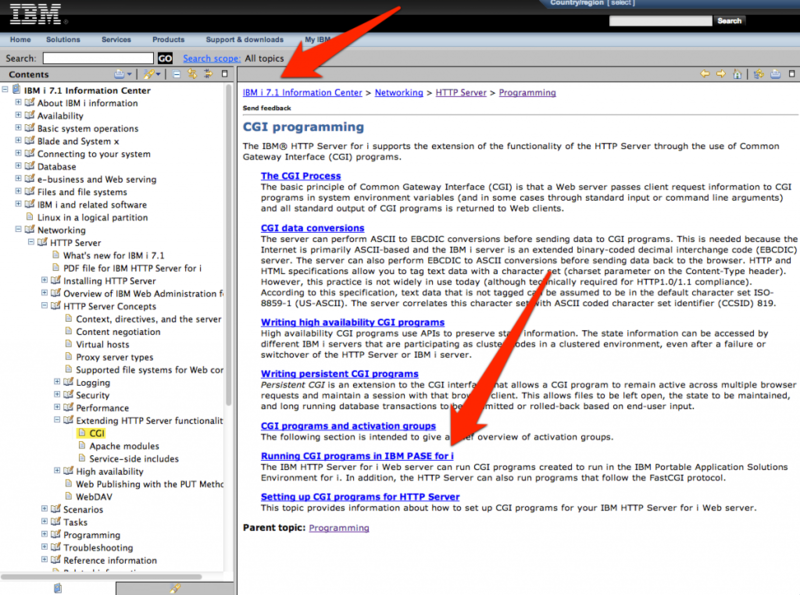 I checked the IBM i 7.1 Information Center and discovered the reference was now made to IBM PASE for i – see here: . The two things I know from this are that IBM is updating their product names to the new branding, and that IBM is working on their documentation to be current. Why don’t you find an IBMer and thank them for their support for our platform, and therefore, our community. They are working for you! 20i3 is the 5th year for the IBM i branding. Our community seems to be still struggling with the concept of an OS running on separate hardware. Our platform is no longer the fabulous AS/400, where the server, OS and applications do everything for our business, and are all called by the same name. In 2010, Apple released the iPad. This game changing tablet has had a profound impact on the world, and is pervading IT departments faster than any other user interface device in the history of computing. Users are now demanding their applications be accessible via mobile – phone and tablet, desktop and laptop devices, all of which require attention from IT to understanding user experience, graphical design, service enablement, modern development methodologies, modern IDE and tooling, and so on and so on. This is modernization of the IT department and the IT developer community. I see many industry pundits or experts preaching the same modernization strategy to the IBM i developer community. This is an ongoing effort, and is slowly converting the community of traditional RPG programmers to learn new skills and new tools, adopt new development methodologies, implement change management and team software, and move into the present. This prepares them for the future of IBM i running on Power Systems, and with that knowledge, they can start to promote the platform the way it is, and they way it will be, rather than how it was in those ‘glory days’ of the AS/400. So how do we educate those community members? The first step, of course, is to drive them to online forums, to social media, and the goal would be – participation, rather than trolling. This is not an easy step, but it seems like there are two groups in our community who can facilitate that – vendors and recruiters. Unfortunately, few of them take responsibility to educate their customers and potential recruits, falling back on the tired old excuse of “it is what our customers want”. The simple response to that ignorance is to explain to them that if they want a future in this industry, they cannot be promoting the glorious past – they must look forward, to maintain the industry, support the community, and extend the life of the platform. The second step is to attract our community to online forums, blogs, industry magazines, and encourage them to engage in some research. This would help to spread the word about the developments to our platform – the separation of the hardware and OS being key to changing our perspective. They would learn about the latest IBM i releases, how the Technology Refresh approach from IBM helps reduce the effort of OS version upgrades while introducing reasonably major enhancements. They would learn about the architecture of service enabling and the modern tooling from IBM. They would see the intense discussions about mobile and web development. Regardless of their level of expertise, a small amount of effort could have positive results, engaging them in their own future and restoring their passion for their platform and their career. The third step is to engage the developers of the future. This step is difficult, as we have to overcome many of the myths surrounding the view that “there are no RPG programmers to replace the ones I have when they retire”. When talking to local schools, they all claim there is no demand for teaching RPG. When talking to local companies, they all claim there is no supply of RPG programmers. Surely this disconnect is SO obvious, that all it would take is a user group to step up and have their members converge on local schools and colleges expressing their demand for students? There is still hope! And no, these three steps are not the FINAL answer, but with these efforts, we can go a long way to preserving the future of IBM i, our own future, and our own legacy. However, the one struggle to overcome in all these efforts is the perception that still exists in the industry that the platform is not IBM i. 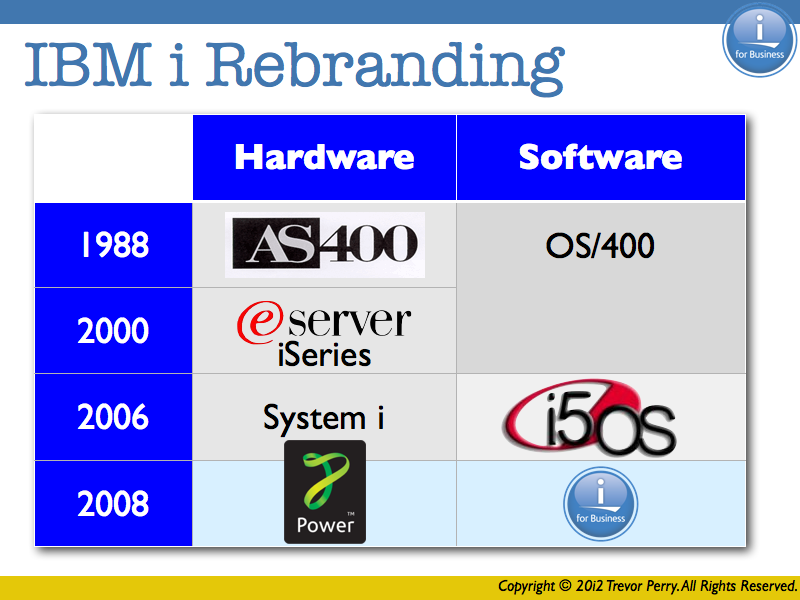 The old branding of AS/400 is now 13 years dead, but still popular. The old branding of iSeries is dead 7 years, and still popular. System i never quite stuck, but there are a lot of people who use the i5 vernacular. All this does is add to the confusion about the branding, and this is the one place we need to pay attention. I have, in the recent past, advocated that people unsubscribe from all forums related to AS/400 and iSeries, and subscribe to forums that relate to IBM i. I encourage people to stop tweeting AS/400, stop advocating SEU, and generally stop treating the platform as though it is still the glorious machine of the 20th century. Certainly, there have been some converts to this approach, and at the same time, some really loud pushback. Personal insults from those who cannot move forward show their reluctance to change, and their fear of that change. I do believe I have an approach that would reduce this fear, and subtly encourage the stalwarts to move into the present, at the least. First, we must stop carrying on about the name of the platform. Just use IBM i or IBM i on Power in our conversations and in our communications. The more we type those words online, in blogs, forums, comments, tweets, articles, etc, the more google will be able to learn about our amazing platform. If we encounter those who do not understand the current branding or stubbornly repeat the old branding like a mantra, simply educate them with “what you call an AS/400, I will refer to as IBM i – the current branding”, and argue no more. Second, while much of our audience belongs to AS/400 or iSeries related forums – a comfort zone of sorts, it is difficult to unsubscribe from those forums when you wish to reach or engage in the community conversations. Obviously, all NEW conversations that we begin should be posted on IBM i related forums. If you wish to reach the rest of the audience, post a link in the ‘comfortable’ forums that sends the community to the new home of the conversation – one that supports the future of our platform. And, the challenge is to NOT respond to questions on those forums. Quite easily, the same approach could help turn this around – write a new comment or response on forums supporting the current branding, then post a comment on the original conversation to link them to the new forum. For a short time, this may be a little disjointed, but that shall soon pass. This approach shows our commitment to the future of the platform, not the glorious past. Responding to a comment on an AS/400 forum simply means you support their fear of change, you support their commitment to the OLD branding and the past, and you support their resistance to modernization of skill sets that is needed in the 21st century. To all IBM i ‘industry experts – it is now FIVE years of IBM i. Quite simply, isn’t it time you stepped up your game? Angus: Step up to IBM i! After attending and speaking at COMMON Sweden in Stockholm, Data3 approached me to answer some questions for the latest user group magazine. Their magazine is published and available here. While much of the magazine is in Swedish, some, including my Q&A, is in English. this is all about, and why it’s important from your point of view? As you know, I am an advocate for improving the perception of the platform. IBM i is a modern, integrated, scalable, robust business platform running on the best hardware from IBM. Given the rich heritage of the platform and the longevity of the people and the applications, there are many people in the community who still regard the platform as the same as it was 30 years ago. For many of these people, the platform has defined their career, and as they get older, change is difficult as they are required to move out of their (very comfortable) comfort zone of AS/400 or iSeries. When I attended IBM Power Systems Technical University, I talked to many people about the platform. I presented a session called “Promoting IBM i and its future to your Business”, and that sparked many conversations also. I discovered three very distinct groups of attendees, and while I did not talk with everyone, this seemed to be a trend. One group was scared and complaining bitterly about the platform not being the same as they knew it. Why they were even attending a Power Systems conference was a question I never asked. The second group were confused, wondering what to do with their platform, wondering how to move forward, wondering how to convince their business that the platform was the best business platform and worthy of investment, etc. The third group were positive about the future of the platform, the future of the platform in their business, and were extremely passionate and positive about their own future. I have concluded that each group can be described with one word – in order: Conflicted, Confused, Confident. The most intriguing part for me was that everyone in those groups used a particular name for the platform. Conflicted people called it AS/400. 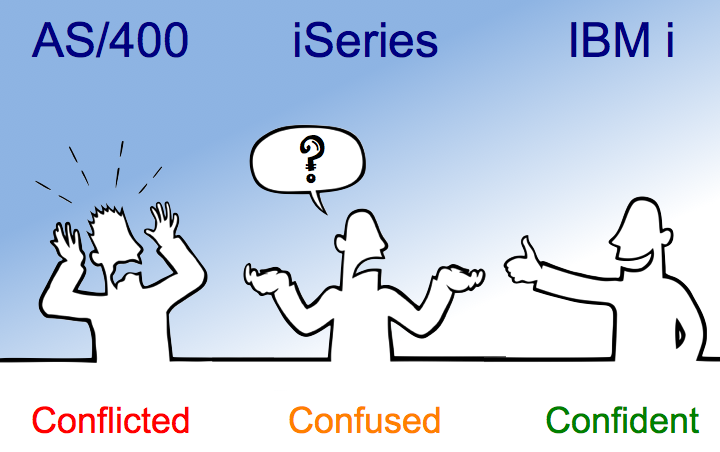 Confused people called it iSeries. Confident people called it IBM i. What a revelation! I donít believe that by just using a particular brand name was the cause of these three conditions, but I thought that it might be the first place to start. If the community saw the platform as modern, integrated, scalable, robust, they would call it IBM i. So I endeavored to use this thought to convince the community that we need to come together on our perception of the platform, and the brand is a good place to start. What came to mind was for the community to step up. I decided to start the Twitter campaign to ask the community to step up. I will tweet ideas and thoughts, and point out where websites and promotions are not geared towards IBM i. I will eventually build some support for this effort into one of my websites, and will provide material to help those who wish to become engaged. This effort is simply one more piece of noise to add to the community promoting IBM i and its future. Wanna play? Twitter needs your #IBMiStepUp hashtag! I was asked to create this 4 inch sticker recently. I managed to ~borrow~ 100 of them, and will snail mail you one if you would like. Email me at angus with your address – I will mail them anywhere in the world. Send NO money! If you don’t want a free sticker, or you want them in bulk, you can buy similar ones from the CafePress Angus store. Also listed there are the 20i3 buttons I will be getting made for the upcoming year. Here is another picture that shows the rebranding of the platform. Some days ignorance is quite difficult to stomach. Most days it is just sad. Unfortunately, when promoting the IBM i platform, ignorance is quite pervasive. Either someone simply does not know about IBM i on Power, or they continue to live in a past that is already going away. I struggle to understand why someone would want to do harm to the platform, yet continue to spread the same old tired myths about naming. Take the usual forum conversation. While the IBM i brand is starting to pervade, there are some contributors who remain stuck in the AS/400 cave, and remain stubbornly lodged in using old branding, come hell or high water. Nothing, no sense, no marketing, no pleading, will convince them that they are wrong. “The rebranding is no longer in the equation. IBM have given us the IBM i branding to match their Power brand, and it will be with us for the long term. “Yeah right. Whatever Trevor, the argument didn’t fly six years ago and it still doesn’t fly today. Not to make it personal, but I have never seen you on here except to rant about the name, Oh and btw, I was at Micro Center tonight and without opening my mouth — not one, not two but seven people referred to their machine as either a “Mac” or “windows”. Not Windows XP, Not windows 7 or anything else. Just windows. It’s a name, that’s it, nothing more and certainly nothing less. I laughed at the inanity for quite some time. Even now I am still chuckling. From my last two posts here, I have discovered the name does matter. (The name matters.. and Where are you in your IBM i career?) IBM i is not just a name, but a brand that represents a platform for today and the future. But their ignorance on that is not the only thing that made me chuckle. If the filter had previously been on, then how would this poster have seen me on midrange-L posting anything, let alone to just “rant about the name“. I guess turning on a filter simply allows the ignorance to continue. I think that is the same as covering your ears when you are a child and don’t want to hear the truth! It is quite sad that there are people in the community who filter out the future. They do not see how their ignorance has an impact on their own career, or how it impacts those around them who listen to their ignorance. I guess you could say they truly are living in the AS/400 cave. While it is difficult to avoid them, since they troll all the popular forums, they are becoming marginalized. I once thought this was a tragedy, to lose so many talented people from our industry. But, I have come to realize that ignorance kills talent, and leaving them behind in the AS/400 cave is the only humane thing to do. And no, I could not post this on midrange-L, it would scare the TOGs (Tired Old Grumpys) too much. Wait, they are filtering me… maybe I can! Just before I left to attend COMMON in Anaheim, CA a close friend told me the following: “You don’t seem happy to me – you just seem stressed or worn out as you would say. I don’t mean to offend. I’m just saying how it seems to me when I see you lately. Both you and [Wally]* seem ready to snap and there has to come a time when you ask yourself if it’s worth it.” I thought about these words and why they were true, and why they weren’t, many times on that trip and initially composed many answers, although I wrote nothing. I knew there was something important in this regarding the paths we chose for our careers. Something about being here professionally, how we came to be here, and why we stay. Something about the times in your life where you just have to kick at the darkness until it bleeds daylight. By the first evening at COMMON my thoughts had moved beyond my personal path and defending it; onto my opinions about the larger IBM i community. I’ve been involved in the leadership of my local user group (OMNI in Chicago) for the majority of my career and as such have attended my share of our technical conferences. In the Spring of 2012, COMMON had an energy I hadn’t felt in a long time. Not excitement yet – but a willingness to believe in the advocacy of others. Attendance was up and people, developers from the trenches, were starting to believe things are going to get better. Before you start to think I am just an IBM i cheerleader who has drank the kool-aide and am promoting the platform to further my own objectives let me introduce you to Wally. Wally isn’t just one person in my life, he is a composite of all the IBM i developers I am friends with and whose opinions will inform my writing. Significantly, this group includes my husband. On that balmy night last May I found myself leaving the COMMON centric area of the DisneyLand Hotel and walking. Eventually I sat in a peaceful courtyard in the Grand Californian and from there I could look up to the balcony of the room we stayed at in 2008. My reaction to the energy of the conference was based on the experience we had during that family trip. We were in the happiest place on earth with our kids, lucky enough to be able to afford it, and by any measure generally successful. However Wally couldn’t transcend a malaise and eventually a terse conversation took place. He felt marginalized, like there was no value placed on his skill set or in his abilities, he had no leverage at work because of the poor economy. Every year it seemed fewer people were expected to do more work, to constantly learn new technologies to meet the changing demands of business and to do all of this for less money. My response to him was something I would repeat many times over the next several years – it has to get better. Just hang in there, your skills are amazing and the market will rebound, be patient. Four years later I have to say I never thought it would take this long. I have always believed everything in life is a pendulum. It is time to be honest and look at the nadir of our experience. There are things we need to acknowledge as a community in order to learn from them. Attending my first COMMON conference was a natural reminder of my first technical conference, OMNI in the late 1990s. At the time Wally and his ilk were at the top of their games. They were known for being the talent that got things done technically and delivering solutions that became business assets. It was easy for him to say to me, you could do this, and for me to think it was a great career move. In those days if you had a pulse and could spell RPG you could get a job. At that first OMNI conference many students from a local community college attended, they were my classmates, and when I look back now I question how many of them are still in the IBM i world. I don’t know, but my best guess based on statistics is that only about 10% probably are. Even then, as we compared notes in the weeks that followed, there were different experiences. The first was people who said the sessions didn’t really follow what they had been learning in class, they didn’t relate. A second was the opinion that no one (vendors) seemed that interested in speaking to students and there wasn’t much information about hiring but that the sessions were interesting. And a third smaller group, who were employed as RPG programmers already, who enjoyed the event and were engaged on multiple levels. A friend of mine had a chance to tell Jerome Hughes (who had delivered two excellent sessions on SQL while wearing an Armani suit no less) about SQL saving the day, albeit interestingly, when there had been an issue at his work. But, that last group had been identified as an employee the company wanted first and learned the language and system second. The two of us are still here 15 years later. I found my home for education. I started volunteering that night, have spent over 10 of the last 15 years on the board, and I have never regretted time spent for this purpose. However I can’t ignore the changes we have seen over those years. We went from the height of Y2K with its prolific jobs and ample salary to layoffs and consulting companies falling apart in the early 2000s. Programmers being told constantly about the need to modernize, and being the geeks they are, knowing the need for GUI/web enablement. The problem was that there was no clear path – should they learn net.data, Java, cold fusion, .Net, asp.net, CGIDEV... Not to mention the ongoing frustration to this day, developers who are embracing modern RPG techniques and standards are still supporting legacy systems written archaically. Those disparate concepts are hard to switch between; one could almost make the analogy it is like telling someone who has quit smoking to have a cigarette. Then there has been the profound struggle thanks to the Great Recession. Now the IT team composites have become multi-discipline and far more complicated further challenging an overtaxed resource. This has not been an easy decade and when I look at where the community is I see the fatigue everywhere. I think the debate over the name of the platform comes from the discontent when people felt they had made a commitment to an industry, done what was asked of them, and were not being supported in return. The iSeries’ years weren’t the best for any of us. Conversationally, many developers had the greatest success of their professional years when on the AS/400. For many it is hard to muster the enthusiasm to believe in the IBM i. As a community we can’t afford this to continue. Yes, things got harder than we ever thought they would. Our company politics and dynamics are more complicated than we ever anticipated. This is the world we live in. The platform is solid. IBM is behind it and supportive, and there is a User Community ready to educate us and the next generation. We have to shake off the negativity or we won’t be able to propel the IBM i into the next iteration of business technology responsiveness. This isn’t up to IBM. It is up to us. To find our voice in organizations and user groups. To attract new talent to the platform even when we have to extend past our comfort zone to do so. To advocate on our own behalf even when it feels like we are a lone voice. To admit how many feel this way, when none of us want to put it into words. It is time to let go of what we had when we worked on the AS/400 and to trust the IBM i will take us further than we ever believed in. The pendulum is swinging back and we have to make what is now possible happen. Angus: Where are you in your IBM i career? In my recent blog entry, I discussed the differences between the three types of developers in our community. Now comes the picture! I was fortunate enough to attend the recent 2012 IBM Power Tech University. As an IBM Champion, I was invited to speak, and presented three sessions – all repeated once, for a total of six. The attendees are a mix of Power Systems professionals, largely representing AIX, with a growing population of IBM i, and a new batch of Linux people. Getting used to a Power Systems audience took a step or two, but the results were that my sessions, primarily IBM i focused, were well received. In fact, I have never been asked for my handouts for any recent events, and Power TechU attendees were eager to take something away. I presented a new session called “Promoting IBM i and its future to your business”, and it was quite an experience. The idea behind the session is to dispel some of the myths we continue to hear in our community, then give some ideas about how to move into the future with IBM i. I started the first session having a relaxed conversation with the attendees, and that backfired a little while they continued the conversation during the actual session. It calmed down, but a couple of people stood out. They objected to many things I was presenting, prior to actually hearing what I had to say. They vehemently blamed IBM as causing the (perceived) failure with the platform, and were very very stuck in their own opinion and own importance. Of course, that accusation can be thrown at many people in our community. We seem to think the world revolves around us, our IT department, or our company, and we don’t often consider that to IBM, our platform is just one of the many products, solutions and services they offer. Even after I pointed out this discrepancy, there were still objections. I asked if any of those people knew how to run a business like IBM or knew how to run a marketing department for a company the size of IBM. I also asked if anyone had a marketing degree. The answer to all three questions was a resounding silence. As the week progressed, I engaged in more conversations with Power Systems customers. At one point, there were two conversations at a breakfast table. From the IBM i customers, we heard all about speeds and feeds, SSDs, TR4 and TR5, and so on. The AIX people were discussing how fast they ran their last marathon. The IBM Power Champions roundtable was a great conversation with IBM i, AIX and Linux well represented. Overall, a positive experience and Power Systems brings together a formidable group of people. Yet the name game was still being played. During the course of the event, I discovered three distinct groups of people in the IBM i community. One group represented companies who were leading the pack in adopting technology, modernizing applications, embracing new methodologies, and being true leaders in the future of their own business. A second group spent a huge amount of time wondering what to do, confused about their choices, and representing companies who don’t know which technology to adopt. The third group, who seemed quite out of place, were complaining bitterly about many things, arguing that everything has changed to their detriment, and generally offering a negative perspective. A little more categorization of these groups, and it was very clear who belonged to each. Those who were complaining bitterly, referred to the platform as AS/400. Those who were confused about what to do, referred to the platform as iSeries. Those who knew where they were headed, referred to the platform as IBM i. The surprise to me was that this distinction is normally not so clearly defined. Yet, at a conference for Power Systems, the borders between the groups are starting to be obvious. I had previously postulated that our community would be split into two groups – those who steadfastly refuse to call the platform anything but AS/400 and want to live in the AS/400 cave forever, and everyone else. That seems to be changing as we move into the Power Systems world, and I expect the three groups will become more distinct over the next couple of years. And, for clarification, this is not a generalization of the entire IBM i community, as I know people who use old vernacular while adopting modern technology and methodologies. However, I expect soon enough, adopting a modern vernacular will simply become the norm. The lesson I learned from this experience, is that the name truly does matter. It is not that just simply calling the platform by the right name, all your woes will be fixed, or the community changed overnight. It is that those who see the platform as IBM i on Power, and therefore call it by that name, are the ones who are moving forward in this industry, both in their own careers and for their companies. Using an old branding identifies you as someone who is stuck in the past, or stuck in the present not knowing which direction is best. So, how do you see the platform? Is it moving into the future? Are you moving into the future with it? If you want to be in that group, then you will need to learn about the platform – as it is TODAY and as it will be moving forward. Instead of spending time arguing about the name being changed, or the name being bad, or the name being wrong, get over it and adopt a new attitude. So far, those who have done that are leading the way – use them as your example. Angus: Time for tough love! I started a recent tweet exchange with “I petition IBM to remove RPG from #IBMi SEU. Require developers to modernize with some tough love!”. While this was a tongue in cheek comment, the responses got me thinking. IBM provides longevity in its IBM i OS by allowing developers to leverage applications and code written on previous generations of the platform. Certainly, this applies to AS/400, and at least back to System/38 and System/34. What incredible technology, what an incredible legacy. On the other hand, this capability of the platform seems to have had another interesting effect. If a business ~can~ run the code they wrote thirty years ago, then surely this platform must be old and outdated! And this accusation is leveled often by platform detractors and competitors. Without marketing of IBM i, the I.T. industry is generally unaware of the evolution that makes IBM i significantly more modern than the predecessors, and a modern, agile, scalable, powerful, integrated business platform. Partly, this view of the IBM i platform as being old is propagated by the same developers who have benefited from the ability to code in the same manner as they did twenty of thirty years ago. Their career has been one sweet ride, using the same principles of coding and development upon which they started their career. Unless they are forced somehow into connecting to new applications, new platforms, or new technologies such as web services, they remain in their 1988 bubble. The community has been making an attempt to spread awareness of the IBM i platform, the branding, the capabilities, the developer tooling. Over the last 4 years, awareness of the current brand name has helped some people realize their own future. PHP has had a remarkable impact on the perspective of a modern IBM i. Industry pundits and educators have spread awareness of the Rational tooling, and as more and more companies upgrade their skills, existing applications are being modernized and developers are building new 21st century enterprise applications. The difficult part for the community is to reach the IBM i, System i, iSeries and AS/400 customers who don’t engage in the community. IBM i vendors are able to reach more customers than are seen at conferences, or are engaged in social media and online forums. Yet there is still not universal adoption of modern technology, modern development, modern methodologies, modern applications or modern user experiences. It is my contention that IBM could fix all of that. One PTF to remove SEU+SDA would do it. Build it in V5R4, 6.1 and 7.1, and send out an urgent PTF fix letter to every IBM i customer whose address is still known. After the PTF is applied, STRSEU simply shows a standard marketing message that informs the developer that new tools are available, and provides them with an easy method of downloading and installing them. Tough love? Exactly. Would it piss a lot of customers off? Absolutely! And in that, the press that IBM i would receive would be global, and reach the entire I.T industry. Imagine if IBM was now lauded as the next Microsoft – requiring an update to developer skills with a new release of the OS? Sure, there will be negative press, we may lose a few customers, but the number of customers we would gain would far outweigh the losses. And, the world would – once again – be talking about our platform. Of course, there would still be a number of companies who never apply PTFs and would not be affected. Some would see the press, and jump on the bandwagon, but the rest would stay in AS/400 bliss forever. Sure, we could make the process a little less disruptive, and provide a phone number to call to get SEU+SDA reinstated. In that phone call, there would be an opportunity to inform those customers of the evolution of the platform – something we have been unable to do as a community. They would then need to upgrade their skills or hire developers with modern RPG and RD Power skills, schools would start to offer IBM i and RPG education, and user groups would be screaming for RD Power speakers. With one small PTF, the entire industry would be reinvigorated. I cannot think of a better outcome! I petition IBM to remove RPG from #IBMi SEU. Require developers to modernize with some tough love! @stevencpitcher: @angustheitchap Some old “features” like that were rendered “broken” during my last round of PTF’s. me: @stevencpitcher That’s just a nudge. I propose a smack in the face..
@stevencpitcher @angustheitchap What would you propose to smack with then? Discontinuing SEU or SDA in the next release? I’d support that. me: @stevencpitcher Yes! SDA+SEU removed in 7.1+1 – tough #IBMi love. And then comes the killer tweet! Trolling for reporting fodder, an intrepid journalist spots a news story, and asks for the source! Wait! What? This is now an official release from IBM? What? Thus endeth this morning’s humor. Why is it, that when someone in our industry is confronted with the issue of them using an out of date name for the platform, their first reaction is not “Oh? Tell me more about IBM i!”? In promoting the promotion of IBM i to our community, I find that about 40% of those who are not using the correct branding for the platform, don’t understand that Power Systems is a new generation of servers, replacing System i and p, and running IBM i. About 10% apologize, and promise they will never use an old brand name again – which lasts about four and a half minutes. The rest, immediately offer some excuse. They justify their ignorance with some tired, vapid, inane ‘reason’, that somehow makes them feel good about their ignorance. There is so much pushback in our industry about using the current branding, that it makes us look quite feeble as an industry. Nothing will suffice for these naysayers. Nothing IBM does will ever prove to them that the platform branding will continue for a long time (in I.T. years). Nothing the community does will ever convince them that the current branding allows us to be, once more, a community united around something wonderful. For some people, it is a simple lack of education about our platform. Simply put, it is IBM i on Power – how difficult can that be? For some, the complaint is about too many name changes – based in truth, but is really FUD. For others, the complaint is that IBM does no, or the wrong, marketing – again, FUD. For lots, the complaint is that the name is hard to use and hard to google – maybe, but if we actually started to use it, those would not be valid complaints. For even more, the complaint is that the name is something “I don’t like”. So? 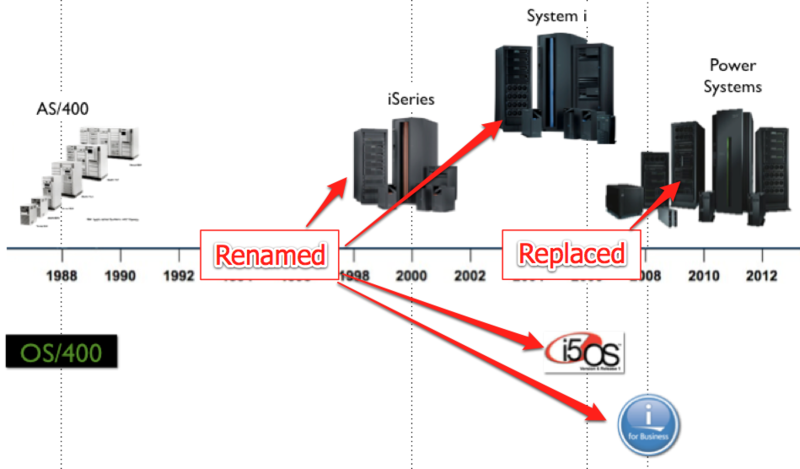 It is the name we have, and if you have already complained about the frequency of the name changes, don’t expect that IBM will change it again based on your whim and lack of marketing skills. Unfortunately, due to this ego filled excuse, we now have people using the wrong name for the platform, which only confuses the issue even more. It is sad that a few bruised egos can really have such a negative impact on the promotion of our platform. I often wish I understood psychology, so I could understand the determined effort to avoid change amongst our community. I expect that soon, the groundswell will overtake the ignorance, and those who are currently complaining will either be laughed at for their ignorance, or get with the program. Who will you tell today about IBM i? Who will you ask to start promoting the future of our platform? It is time to stop the negativity, reclaim our passion for the best business platform on the planet, and move forward. One of the common complaints about our platform is renaming. It seems to be the last defense of a community fighting to retain some identity to which they used to belong. Or, it could be just fear of change and desire to keep complaining. How horrible that seems to many in the community. Yet, in 32 years, with technology busy changing shape, form, substance on an almost daily basis, we cannot get over this “atrocity” forced upon us by IBM. And, every time the complaint is made, there are the usual “justifications” offered about how other companies don’t rebrand – (refer to MS and Windows), how other companies don’t do this, don’t do that, and so on. And so on. And so on. Certainly, branding changes can be successes or failures. Everyone cites New Coke as a branding failure. No one who is arguing about the rebranding of IBM i will ever look beyond their own complaint to see branding changes that were success. So, here is one: Starbucks! Ok, so the name was not changed, but the logo has! For reference, this picture was found here. And here are some concerns about the Starbucks rebranding offered by pundits. Will it sell more coffee? I love this particular whining: “Was the Starbucks corporate office asleep through all of the Gap controversy when they tried changing their logo? Leave it alone! There’s nothing wrong with it,” a fan wrote on Starbucks’ Facebook page.. The whining sounds familiar, but really, do you EVER hear about the change to the Starbucks logo any more? IBM i on Power Systems is such a wonderful platform, yet its name is still a debate in the community. How strange. Mel Beckman asked the question “Is RPG Dead?” and now Aaron Bartell says “it is time for Mel Beckman to retire“! And Jon and Susan tell us “It seems to us that articles such as this only serve to harm the community“. So, what should we think about this? Let’s review. Mel says “But every technology has an end to its adaptability, and I believe RPG has reached its limit”. This is simply one man’s opinion – he even used the words “I believe”. And, having read and disagreed with Aaron’s opinion before, I know he has posted many things quite as controversial. If Mel is to retire for his opinion, shouldn’t Aaron be forced out also? Looking at the harm value of Mel’s words, the resulting outcry to support RPG has been, on the whole, quite fabulous. Of course, as with any controversial opinion in our industry, there have been replies from the negative, the upset, the scared and the whiners. But Jon and Susan’s blog, along with other postings, have been well reasoned, well written and strongly in support of RPG and its future. Certainly, if a reader were to stop at Mel’s words, they may believe his opinion and suffer some harm. Also, if certain other industry and RPG detractors were to jump onto the same dinghy from the RPG ship, there could be additional backlash. However, there is now a conversation in the community about RPG that did not exist yesterday. We talked about it among ourselves, in sessions at conferences, and at user group meetings. But in the bigger world of the internet and social media, the conversation that resulted from Mel’s article has shown how strong RPG is, and how Mel’s opinion is simply just one person’s opinion. I believe – that is, my opinion is that no harm has come to RPG and the resulting press will simply bolster its longevity. I do think two things should come out of this. One, Aaron should retire – ok, that is tongue in cheek, we need his strong opinion and perspective in our community. Two, the language should be renamed to reflect its longevity. Maybe RPG-NGA for “Never Going Away”? Or Z-RPG to reflect RPG’s ability to rise from the grave one more time and live as a well functioning Zombie. With details on the naming! Within our community, we argue about the name. Seems like there a thousand reasons why we should keep calling the platform by a previous name. Very few people have specific reasons why we should use IBM i as the platform name when we talk about how good it is. This advertisement is just one more of those reasons. Put simply, this vendor is using the name ‘AS/400’ as something undesirable. They suggest that you are running ‘legacy applications’, and they ask you if you are ‘still running’ those applications on AS/400. They offer to recompile these ‘AS/400 legacy applications’ onto Windows, Unix or Linux. They also contend that these new locations are ‘open platforms’! While we continue to use the old terminology, we will continue to have vendors telling the world that we are using old technology, and telling us we need to migrate to another platform. Breaking the habit of using terminology that fits our comfort zone is a wonderful defense against attacks such as these. I imagine them calling an IBM i shop, and saying “Would you like to migrate your AS/400 applications to open platforms?”. 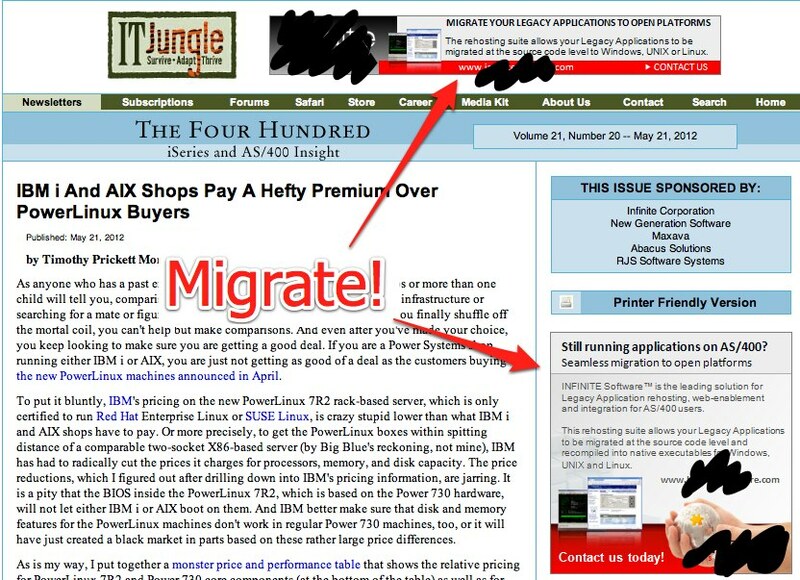 What would they do when you respond with “We already migrated them to an open platform – IBM i!”? Angus: Do we need IBM’s help? Having posted the IBM i community survey at ibmi2.com, the results are intriguing, to say the least. Much of the pushback about the platform and the name seems to come with pre-built tired excuses. Most of it seems to stem from resistance to change, and in that vitriol, IBM is blamed for many things, including poor marketing, ‘too many’ renames, and so on. While the IBM blame game stems from much misinformation, myth and fairy tale, there are a couple of obvious things over which IBM does have control, which are impacting the community. First, IBM internal references to the platform. Second, IBM i OS itself. Let’s review each. One of the common excuses is that IBM still refers to the platform as AS/400. We hear that from IBM sales people, from IBM support, and from other IBM employees who think the AS/400 is dead. During the PureSystems announcement, one of the speakers uttered these words: “IBM has been at this now for some decades. Some of you will remember AS/400. This is an application system that was an industry specialized solution, that was designed to go work. Many of these systems, by the way, are still working. I’ve happened to run into quite a few of them as I go around the world.” While we know the majority of the Power Systems team at IBM are working to promote IBM i, this is very sad. While at the COMMON Annual Conference in Anaheim recently, the IBM Champions were able to spend a little time talking to the Power marketing team, including several IBMers with IBM i responsibility. From that, we were led to believe that there may be an opportunity for IBM Champions to talk to IBMers. Until one of us is in front of a group of IBMers, I will remain skeptical, however, it is nice to know this could be a possibility. Regardless, IBM needs to do something about this perception of IBM i inside their own organization. Of course, that also applies to their business partners. In one hardware partner I know well, they still sell System p and iSeries to this day. While there are certifications for IBM business partners to show their skills in technical and platform sales, maybe there should be a certification required of ALL business partner employees on branding and nomenclature. Add to that a set of presentations on how to educate the customers on their chosen platform, to pitch the future of the platform and counter the competition attempting to sway those who see “AS/400” as old and outdated. The second point is in regard to the IBM i operating system itself. There are still many places inside and around the product that require attention. 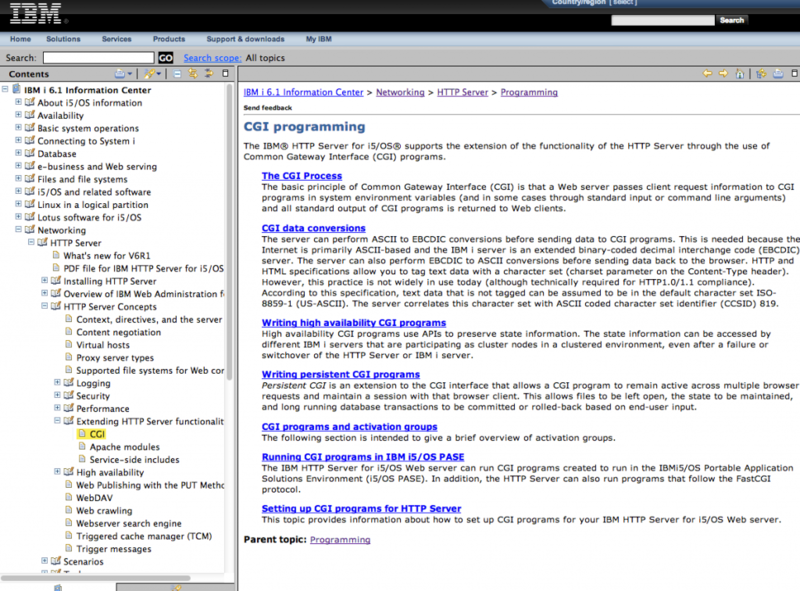 One simple example is the page related to the IBM i Access product. While the ‘Client Access’ name is sticky, the correct branding is now applied to the product. Until you look at the title, which says: “IBM System i Access for Windows Home Page”. This lack of attention to detail can be another flame in the fire that burns against the current branding. Certainly, there are a multitude of redbooks and documents that contain outdated references, and it may be appropriate to recognize the enormity of that effort and give it some leeway. And, it is important to note that none of us know, or expect to influence, where IBM places its budget for OS enhancements. Given a choice of fixing nomenclature and providing enhancements to the OS, our preference is certainly with the latter. The issue is not so much with the nomenclature or its use (we will get through that in a decade or so), but with IBM not publicly showing their commitment to working on either of these efforts. If we are to have the IBM i branding for the long term, and IBM has committed to that, it would be nice to see a public face on these issues. So, if these issues matter to you, ask an IBMer next time you see them. Start with your appreciation of what they are doing for IBM i and the community, then add the request for them to tell the community how they are going to address these items. Or, tweet a request, write a post on LinkedIn, make some noise on an internet forum, spread the word at your local user group – the possibilities are endless! Angus: Mentally deficient, old, stubborn, or …?? Discuss! Here is a question for you. Why did you get into technology? Was it cool? Was it intriguing? Did it offer new things on a regular basis? Was it challenging to build new and better things every day? Maybe you had other reasons. However, I don’t know of anyone who got into I.T. expecting to be maintenance programmers. I don’t know anyone who decided programming was simply a means to the end of retirement. We got into I.T. for the simple reason that it was interesting. Over the last 30(something) years, our platform has evolved from a System/38 to the most amazing operating system – IBM i, running on the world’s best business hardware – Power Systems. Had IBM released the Power Systems 20 years ago, we – yes, all of us, including YOU – would have embraced this platform with fervor. But somehow, things have ground to a halt. We sit around talking about the good old days, how things used to be better. We reminisce about what we ~used~ to do. We seem to have lost the plot. I am concerned about all of us – we have become old, stubborn and stuck in our ways, with little to no chance of anything exciting happening in our world on any given day. You know what makes me say that. EVERY conversation I have in this community contains something ridiculous about the platform. Either a conversation includes a bunch of references to the old and outdated platforms, or an old name is used for the current platform as a matter of course. And, when I ask, prod, nudge, cajole or plead for the speaker/writer of the outdated references to remember that IBM gave us Power Systems in 2008 (yep, FOUR years ago – a LIFETIME in I.T. ), I get pushback. In fact, I get excuses. Tons of excuses. Waaah, waaah, waaahmbulance. IBM did this. IBM didn’t do this. The name changes.. Bad name. Wrong marketing. Not what ~I~ want. Waaah, waaah, waaah. EVERY time. Excuses. Nothing else, just excuses. Not a single person has given me a valid reason to reference the platform by an OLD name – not once. Why? Because there are none. There are plenty of excuses, but not a single reason. As I get horrible pushback, insults and complaints, I wonder why it is like this. And I can only suppose one of three things. One, for some reason, coding RPG or working in the midrange world has made us mentally deficient. Yet, most of us appear to still have our faculties. That leads me to… Two, we are old, stubborn, and out of date. We lost the plot. We lost the passion. We live in a world where it is comfortable, and we simply don’t want to budge. We cannot change, and nothing we can do will make us change. I think that is the reason, but that saddens me. Because the only other possibility is that we are afraid. Consider this – if someone calls you out for referring to IBM i on Power as an AS/400, and you don’t say “oh yeah, that was the grandfather to IBM i”, then you will probably pull out one of the 6,749 lame excuses and use it to justify your own stubbornness and fear. So, am I right? Or, are you a flexible modern I.T. developer who works on AS/400s? Nah, can’t be. There ARE NO EXCUSES. The platform has moved on. Why can’t you?